While enjoying the three-day weekend I found myself with some free time, two grills and a couple of chickens that I needed to cook for dinner. Normally I would fire up just one grill and cook them up, but this time I decided to conduct a little experiment. My pseudo science project was to cook one chicken on my Weber gas grill and the other over lump charcoal on the Big Green Egg. 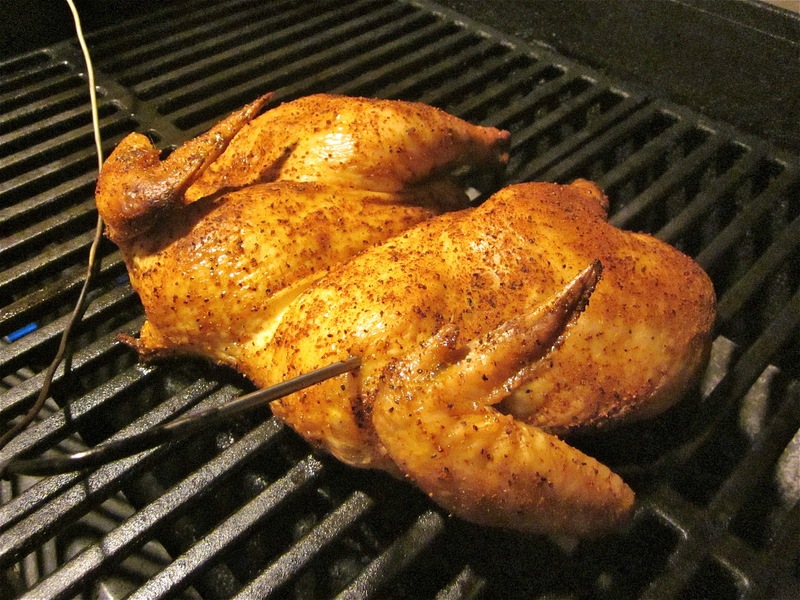 I have eaten plenty of poultry from both grills but never at the same time, nor have I ever conducted a side-by-side taste test. I wanted to see for myself how big the flavor gap between gas and charcoal really was. I started with two whole spatchcocked chickens seasoned with my AlbuKirky BBQ Rub. After seasoning the birds, I placed them in the fridge overnight, uncovered. I left them uncovered to let some of the moisture in the skin evaporate and help crisp up the skin during the cooking process. 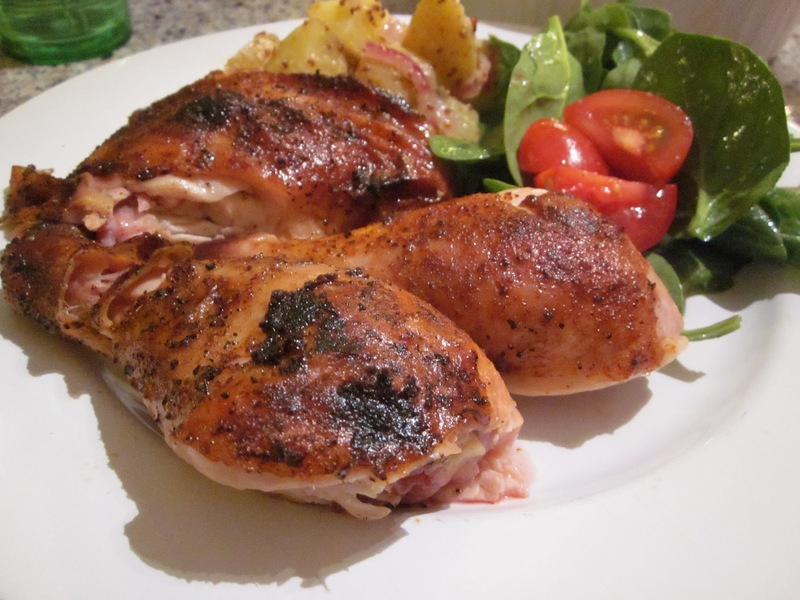 The poultry pair was cooked over indirect heat at 350F for about 1 hour to an internal temp of 160F. After the meat reached an internal temperature of 150F, both were flipped and cooked skin side down to crisp the skin for about 10 minutes. Now for the results, Cheryl and I had pieces of each chicken and graded them on a scale of 1-5. The categories we graded were Taste, Moistness, Crispy Skin and Smoke. As I expected the charcoal chicken tasted better overall but I was surprised by some of the results. Taste – The flavor of both birds was very good. The rub on the gas-grilled chicken was slightly more predominant and most of the flavor was in the skin. 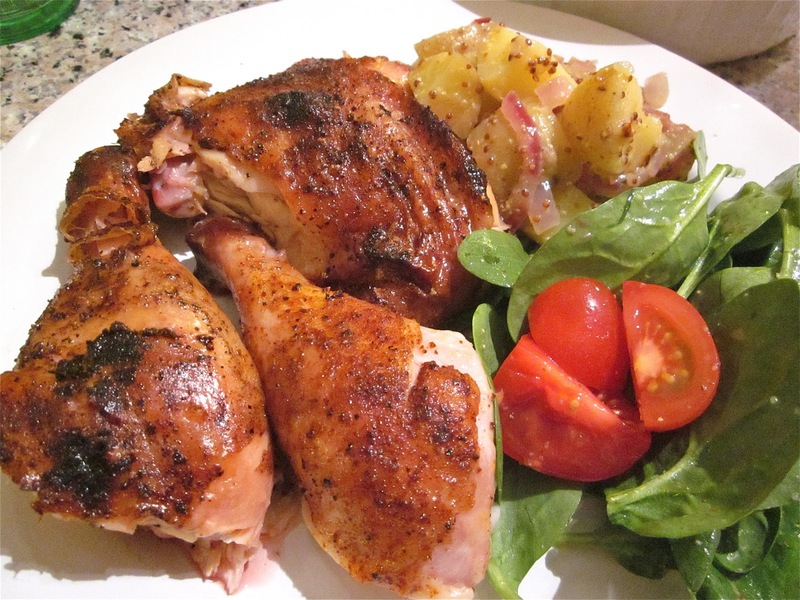 The rub was not as predominant on the charcoal chicken and the flavors seemed to permeate the meat. 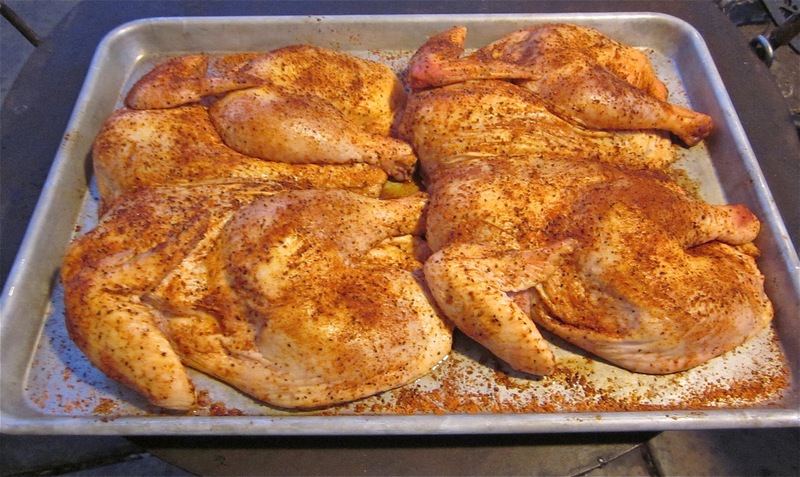 Moistness – Both methods resulted in moist chicken. Cheryl thought the gas chicken was slightly juicer, but I thought it was a tie. Crispy Skin – I was expecting the gas grill to perform better in this category. The skin was cooked evenly but just did not have quite the snap of the charcoal cooked skin. 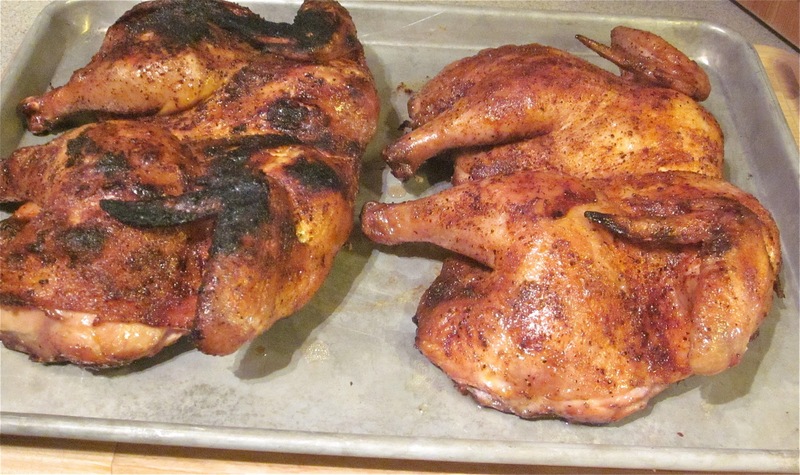 Both birds were cooked over direct heat during the skin side down cooking. The BGE did char the wings a little too much though. Smoke – As expected the charcoal chicken won this category, but the gas chicken had a slightly smoky flavor from the burning of the fat drippings but the taste was slight and it did not compare to the wood flavor of the charcoal. The charcoal chicken was the winner but I was expecting it to be a closer race. I thought the skin score for the gas chicken would be slightly higher. Maybe a couple of minutes more on the grill would have made the difference. But now I have some work to do improve my gas-grilled chicken. I think with a few tricks I can get the gas chicken to taste almost as good as the charcoal. All I need is a couple of long weekends, some fresh chicken and my ever-present appetite. Rest assured once I figure it out I will tell you all about it. Great side by side review! The scorched wing tips is why I like tucking them behind the shoulders. Yah, I'll remember to tuck the wings next time. But then again I'll probably forget by the next time I cook chicken again. I like it Kirk…wish I had a Weber! There is no way I am going to get hold of your rub this side of the world tho. I wont ask you whats in it ha ha! Your test results don't surprise me. I have always instinctively preferred wood over gas. Its just a lot more tricky to regulate temp tho'.